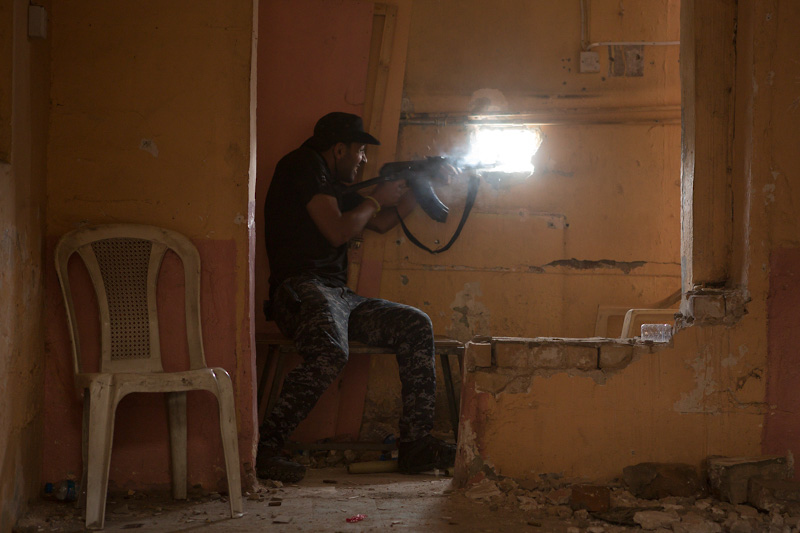 Inside an old hotel on the edge of West Mosul’s Old City, a Federal Police marksman takes aim with his rifle. A small circle of light beaming in from outside the room reflects off his PSL’s telescopic sight onto his eyeball. He concentrates, staring through a small crack between concrete blocks, wood and an old sheet. The police officer’s breath slows to a halt as he gradually squeezes the weapon’s trigger. The report of the rifle’s shot echoes around the room and the ejected cartridge rattles off a concrete block. The marksman pauses for mere seconds to look at the ISIS firing position into which he sent a 7.62x54R round, before pulling back, away from the firing slit. He sits down on a plastic lawn chair to joke with a colleague as the smell of propellant wafts around them. 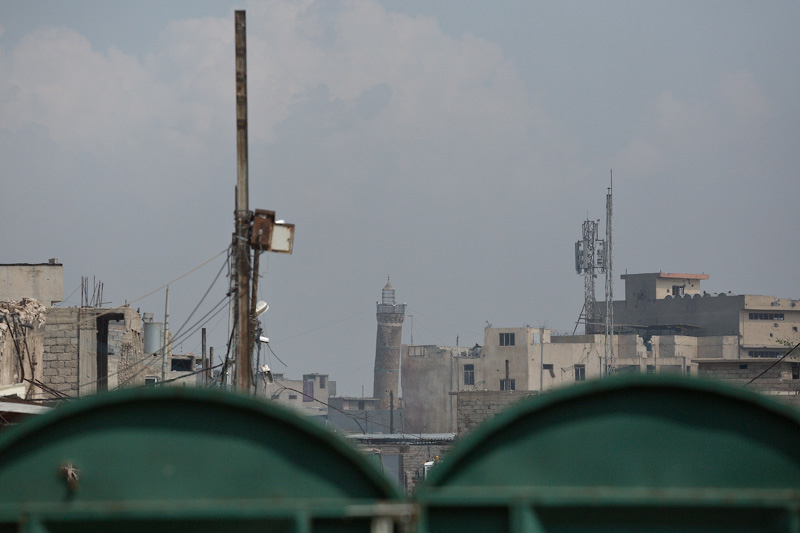 Much like the Corniche, the fighting in the southwest of the Old City is slow going. 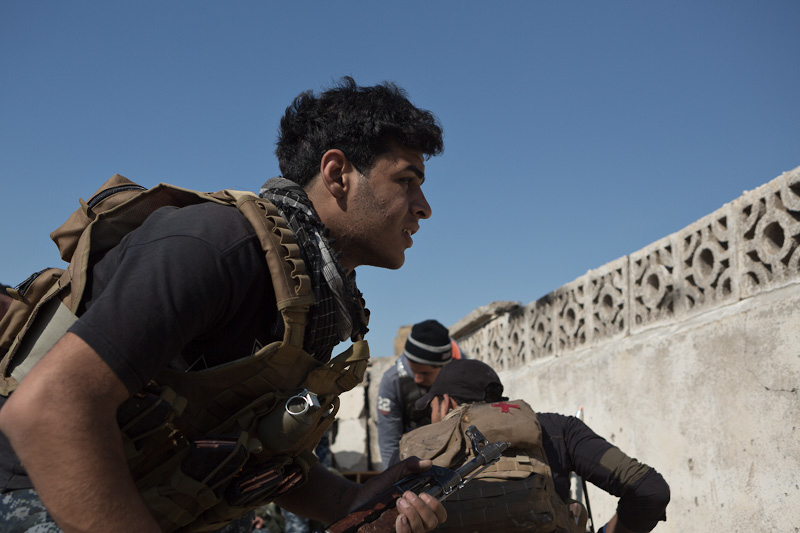 The battle for Mosul is one of the largest urban battles since World War II, and both the Iraqi army and ISIS employ snipers and sharpshooters to target each other throughout a dense warren of buildings. Close air support is crucial to the continuing Iraqi operations in West Mosul, but is often hampered by seasonal storms. 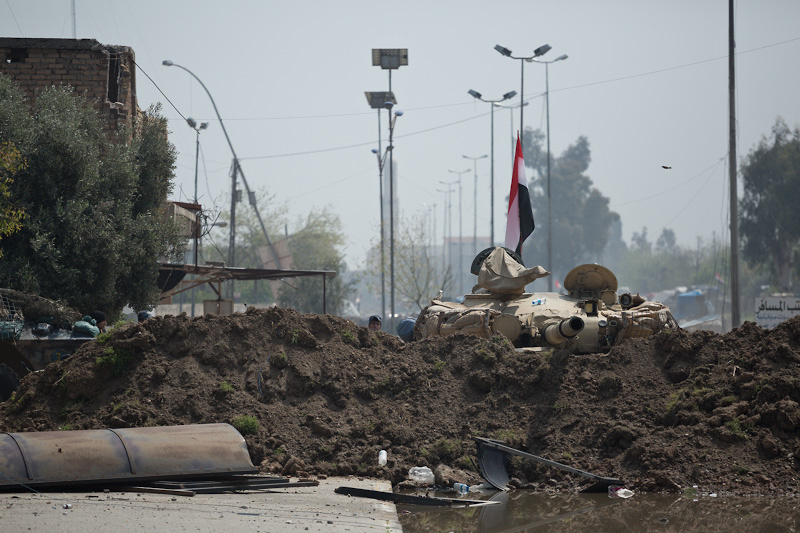 On Tuesday, April 6, 2017, the Iraqi government confirmed that one of its attack helicopters had been shot down over the city, killing two crewmen. Urban combat is one of the most dangerous kinds of warfare. An enemy can hide in a thousand different places. Spending a mere second or two in the open can be deadly. When on the attack, a defender can more easily spot movement and shadows than in other environments. The marksmen here say they have to be extremely careful. “We have to be sure when we fire, because each time we do we give away our position,” a police officer says, before adding that the group shot and killed an ISIS fighter last night. Today is April 1. Officers quickly move past firing positions, and they completely avoid areas within some rooms—places they know to be unsafe—including a thin metal door next to one of the sharpshooters. One man points up to a wrecked skylight above the door and says, “kinas,” the Arabic word for sniper. 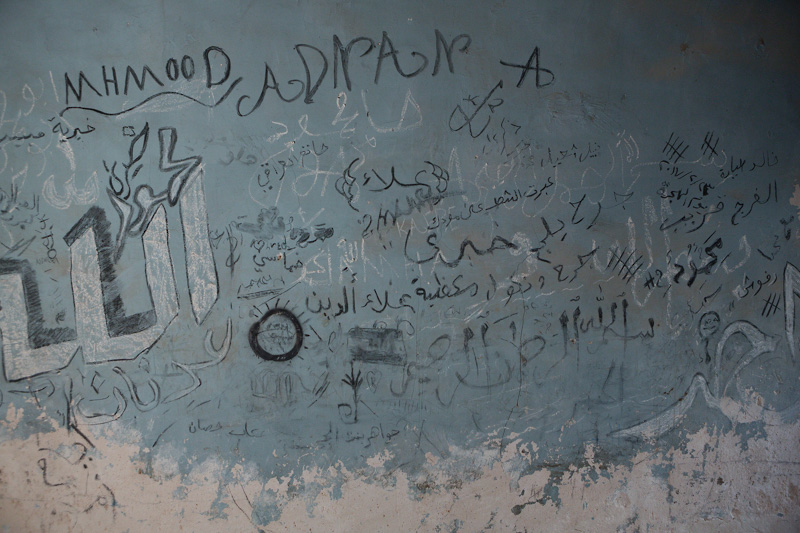 There’s no glass left in the window and the divots, caused by ISIS bullets, cover the wall behind. 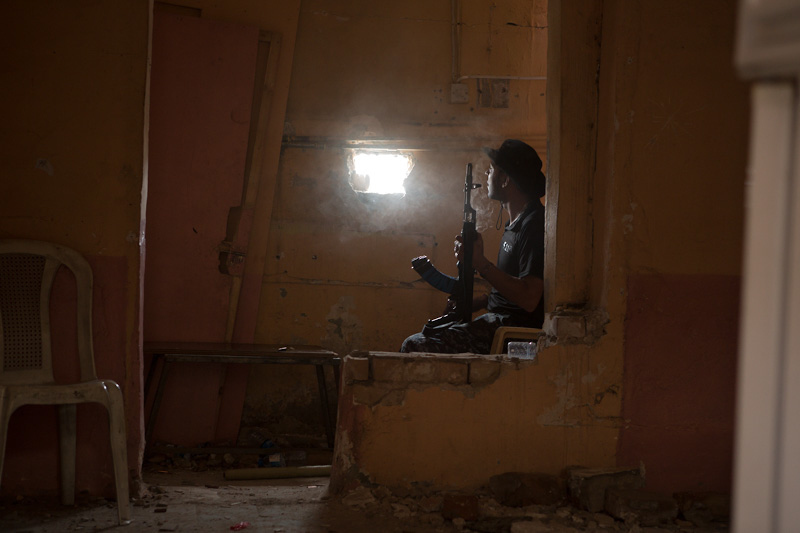 In a dim room next door, Abbas, a police marksman, studies the scene through a hole knocked in an external wall. He has spotted movement in a building. Sitting down on an old table, Abbas rests his Russian-made AKM rifle, oddly fitted with AK-103 furniture and muzzle break, on the ledge of the hole and pulls down hard on the trigger—letting loose with fully-automatic fire and emptying the contents of his 30-round magazine. The officers in the team have seen several ISIS fighters moving around. One officer uses a GPS app on a smartphone to pinpoint their positions. Outside the room, the fighting begins to escalate. 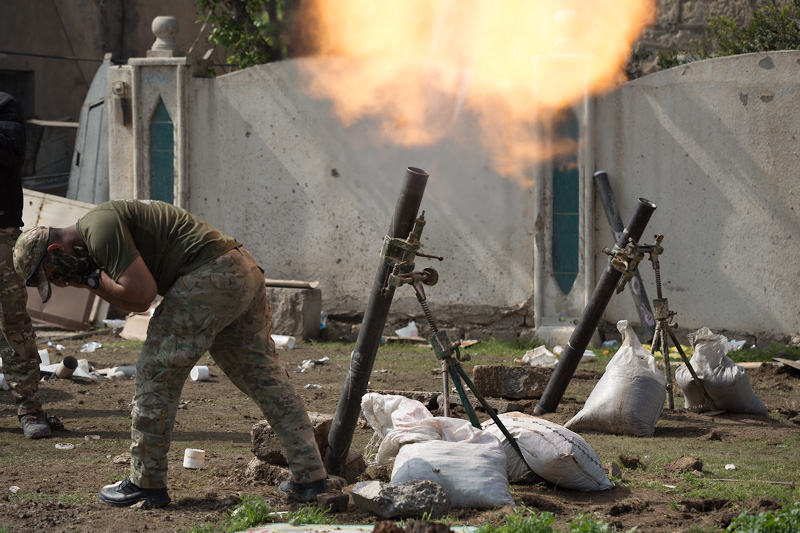 Mixed in with the sound of rifles are long bursts of machine gun fire, the occasional thump of exploding Iraqi mortar shells and the fast-firing 30-millimeter cannon of a Mi-35 Hind helicopter providing overhead support. A gunner opens up with a PK machine gun from the sniper’s position in the next room, and the boom and concussion of an RPG-7 being fired from the rooftop reverberates throughout the hotel. The shooting isn’t all going in one direction. 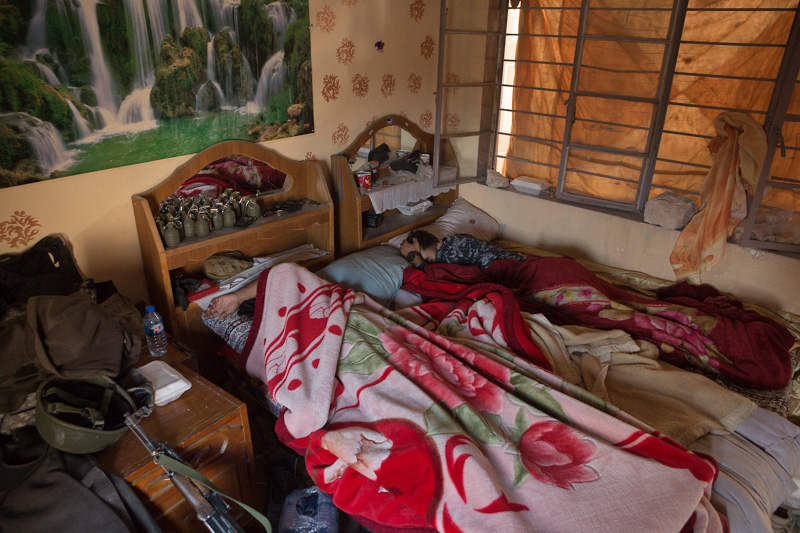 After the soldiers pull back from their firing positions, several ISIS bullets hit the hotel’s brickwork, near where the police were shooting from, with a wet slap. After a short discussion the officers prepare to fire another RPG from the roof. 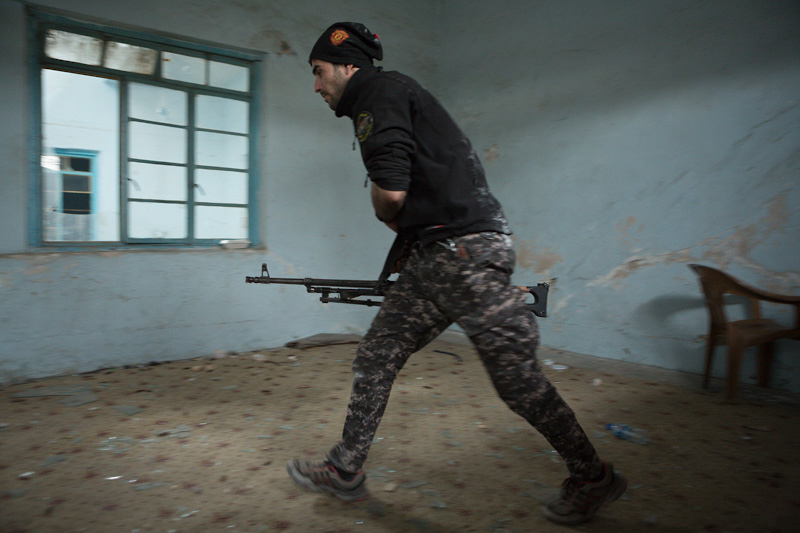 One man, called Ali, his head wrapped in a scarf, grabs one of the team’s rocket launchers and ascends a set of stairs in the corner of the room. He keeps low as he peers around the brick-enclosed stairwell. 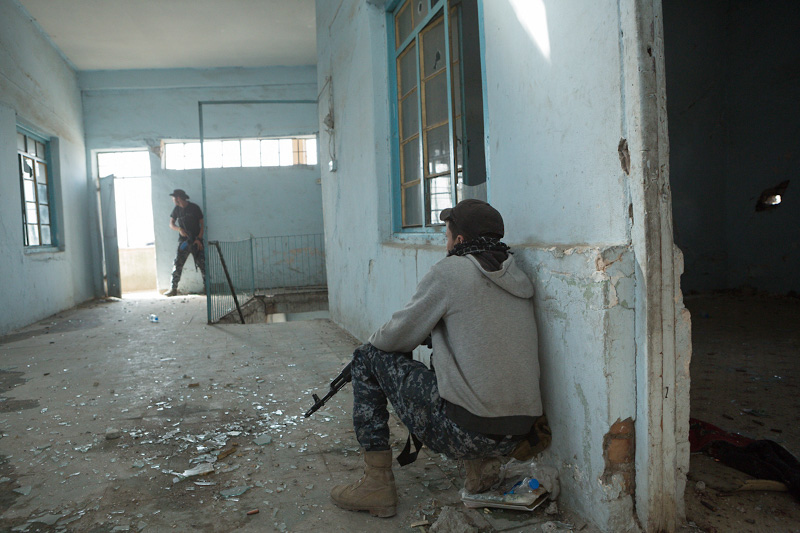 The walls surrounding the roof are low, and Ali needs to stay crouched to remain in cover. He discusses the best way to hit the target with a colleague. Downstairs, other officers shout information up at the team. Ali moves onto the roof, and keeping himself low, he hauls the launcher with its bulbous missile onto his shoulder. Closing his eyes, the policeman steels himself. 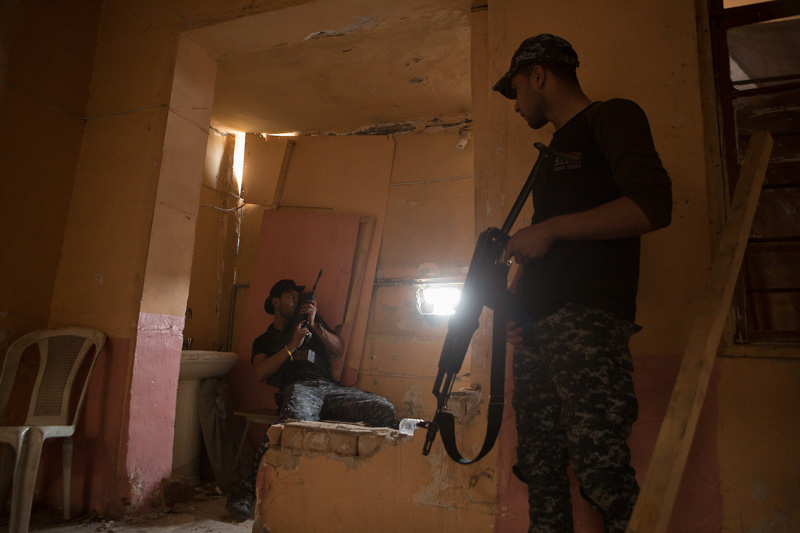 To fire the weapon, Ali will have to rise above the surrounding wall and expose himself to any watching ISIS snipers—dangerous enough when things are quiet, let alone during the ongoing firefight raging around the hotel. After taking a deep breath, Ali stands, shouting aggressively. Downstairs, his friends occupy every available firing position and begin laying down a crescendo of covering fire—giving Ali the breathing space to fire the rocket. He takes one last look down the weapon’s sights before pulling the trigger. With a boom, the rocket launches away from the tube. Ali flinches as the back-blast throws debris all over the rooftop. Hanging around on the roof is not an option, so Ali runs to the stairwell and quickly descends to the room below. 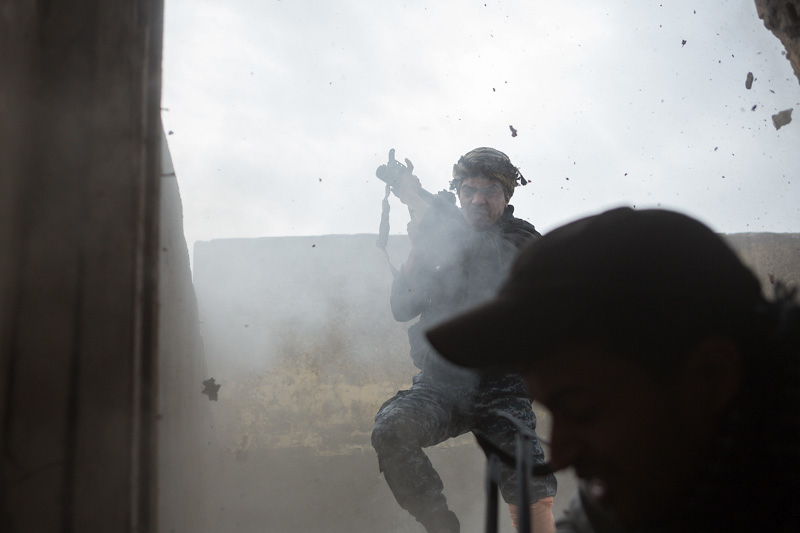 From rising to firing, Ali was exposed for less that two seconds, a lifetime in West Mosul. Downstairs, the rest of Ali’s team have also pulled back. 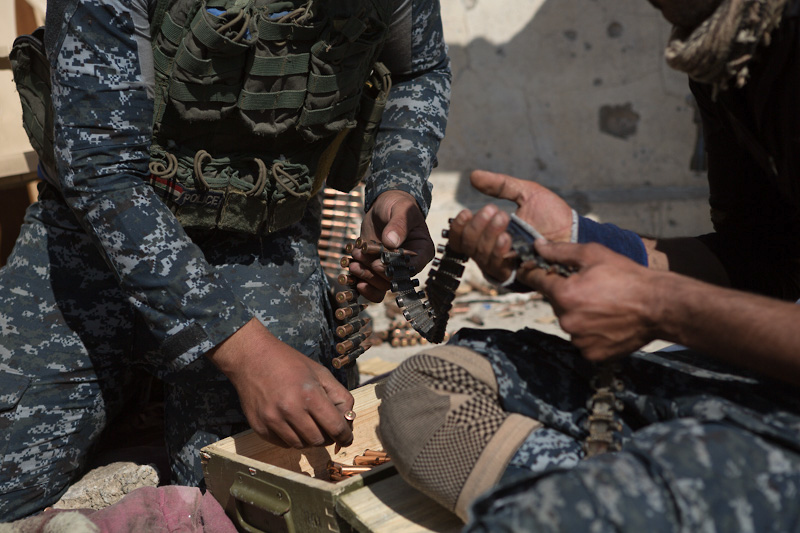 They carry out the laborious task of reloading the ammunition belt for their PK general-purpose machine gun. Each man dumps the contents of small cardboard ammunition boxes into a backpack, then they grab from the pile and push the rounds them into a black, metal machine-gun belt. 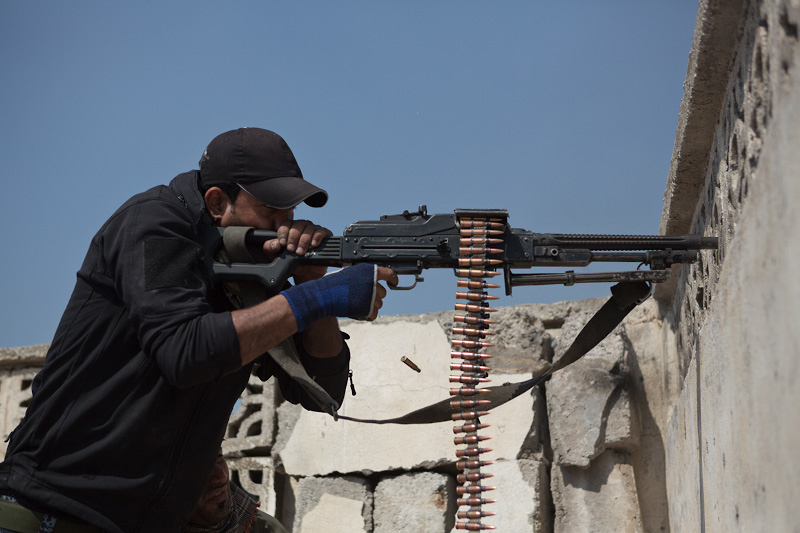 Ali slides another rocket into his RPG-7 launcher. Satisfied the rocket is seated correctly, he leans it carefully against a wall between two spare warheads—ready for use when the next target appears. He smiles when hearing that the building he hit with the RPG is on fire, because at least it means ISIS is unable to use it for now. The police stay back from their firing positions as they sit and talk. 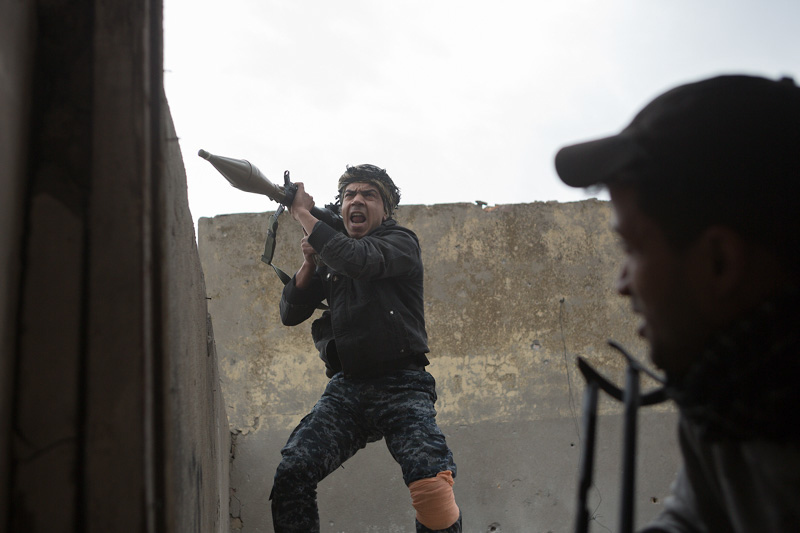 Ali mimes firing the RPG to his friends. 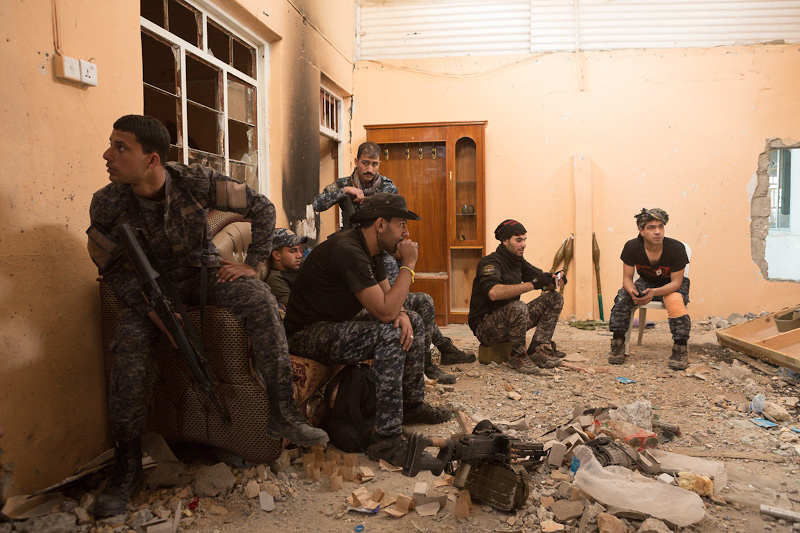 The men laugh as incoming ISIS rounds hit the building. Several bullets perforate a metal door next to a boarded-up window, and glass falls from a skylight at the top of the room as several rounds crack into the wall behind it. The officers seem unfazed as they chat. Outside the hotel, a Federal Police officer sprints across a street known to be within view of an ISIS sniper. He, and a group of colleagues, are preparing to move to reinforce another position in a nearby building. A machine gunner makes last minute adjustments to an ammunition belt draped around his shoulders, ensuring it will stay snug when he moves. Rain starts to pour from gray clouds above the city. The light is fading and it’s a dangerous time to be on the front line, as Islamic State militants often make use of bad weather to mount attacks, knowing that air support is not possible. As darkness falls, rolling thunder mixes in with the sound of explosions as the tempo of fighting around Mosul’s Old City intensifies. Dawn breaks the next day. Overnight, a thick blanket of fog enveloped the city, reducing visibility to no more than 10 meters. 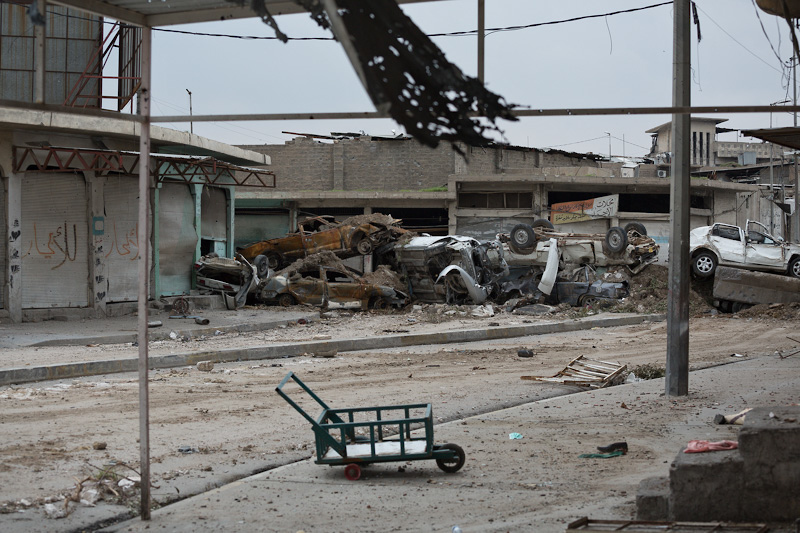 But West Mosul is quiet, and despite the fighting during yesterday’s twilight, the Islamic State did not use the rain or the morning’s lack of visibility to launch an attack. The sun soon starts to burn through the fog, removing any advantage it would have given the militants. Around a kilometer from the hotel where the Federal Police marksmen were working yesterday, a team of Emergency Response Division soldiers are firing mortar rounds at ISIS positions in the Old City. 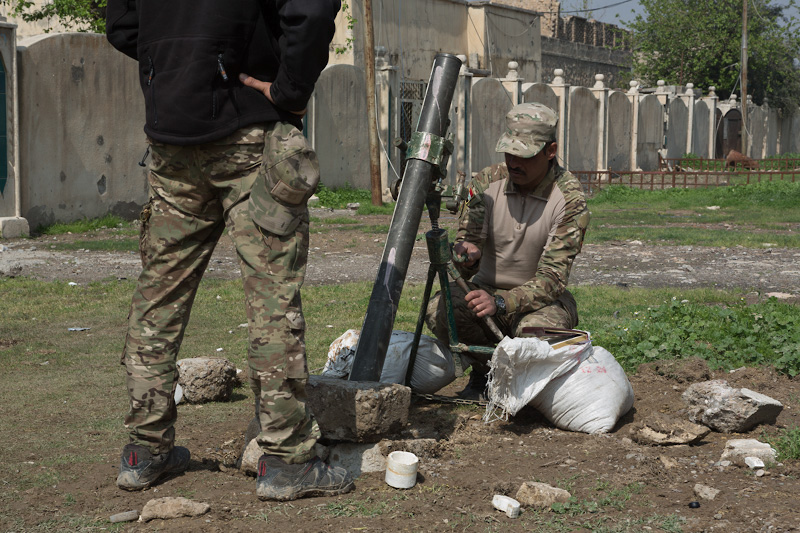 The mortar team has two different types of mortars—short, squat and gray 82-millimeter M37s, made in Russia; and American-made 81-millimeter M29s, which are longer, slender and green. Working as a well-oiled machine, the men remove packaging, strip off the extra propelling charges and place the shells in boxes ready to fire—only the safety pins stay in place. The soldiers take care not to mix the two types, even though there is only a millimeter’s worth of difference between them, as they don’t want to accidentally stick the wrong shell in the wrong tube. Each time the mortars fire, the team commander receives directions by radio, and he and his assistant dial in corrections to bring the next round onto the required target. 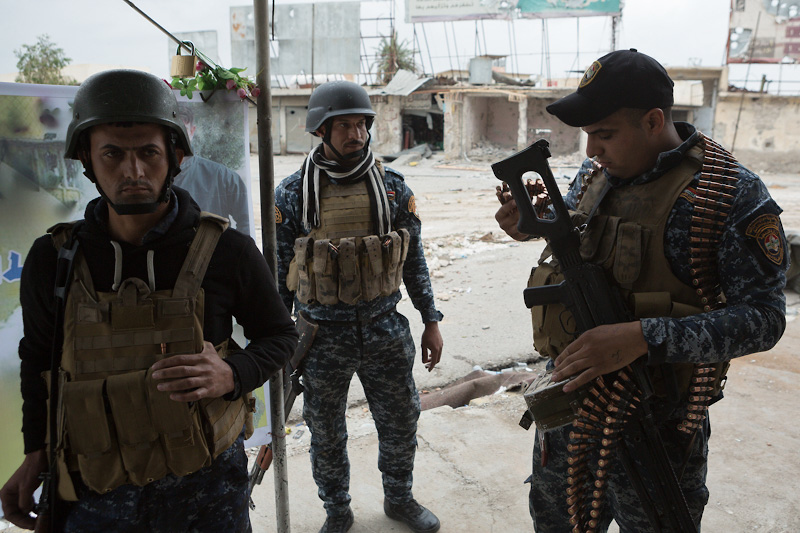 The Emergency Response Division is the Iraqi military’s attacking, room-clearing force. There is no attack planned by the ERD today, but they still have teams on the front line, and the mortar group’s responsibility is to support both static ERD positions and those of the Federal Police, who are responsible for holding any retaken ground. At the center of the Old City is the Al-Nuri Mosque, where ISIS leader Abu Bakr Al Baghdadi declared the “Islamic State” in 2014. Retaking the mosque would be an obvious symbolic victory for Iraqi forces, but Iraqi commanders are not sure whether ISIS will demolish the 800-year-old building before troops arrive. The road to the hotel where the Federal Police snipers fought from yesterday is long and wide. It’s not on the front line, but is far from safe. Traveling north along the road is best done in an armored vehicle, as many of the alleys and smaller roads leading toward the Old City are in view of ISIS snipers. As a reminder, occasional rounds crack down the roads as Iraqi troops sprint between buildings. The Iraqi defenses here consist of several earthen berms. Each one is an obstacle to any potential ISIS counter-attack. The Federal Police’s eight-wheeled BTR-94 armored personnel carriers—a Ukrainian modification of the Russian BTR-80—along with M1117 armored security vehicles and even T-72 tanks of the Iraqi 9th Armored Division wait in position to provide support in the area. Armored Humvees, prolific throughout this conflict, move between positions as their drivers drop off troops and supplies. In a nearby side alley, a Federal Police officer walks toward the front line. The alley, on the edge of the Old City, is only three meters wide. 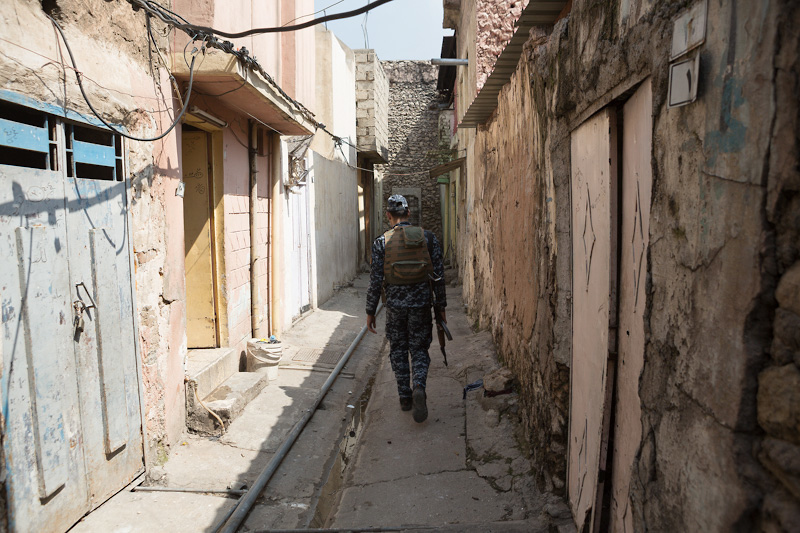 The passageways deeper inside Mosul’s older districts are even narrower. 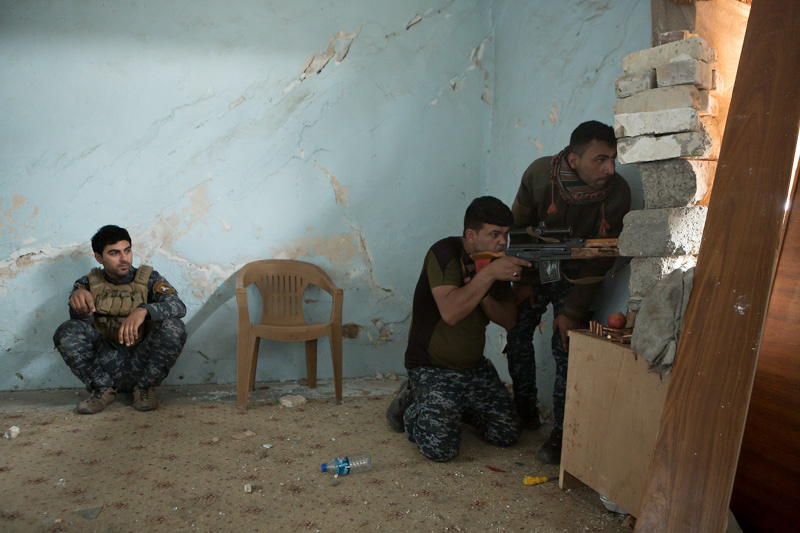 The Iraqis use more than just alleyways to maneuver their way to the front line. 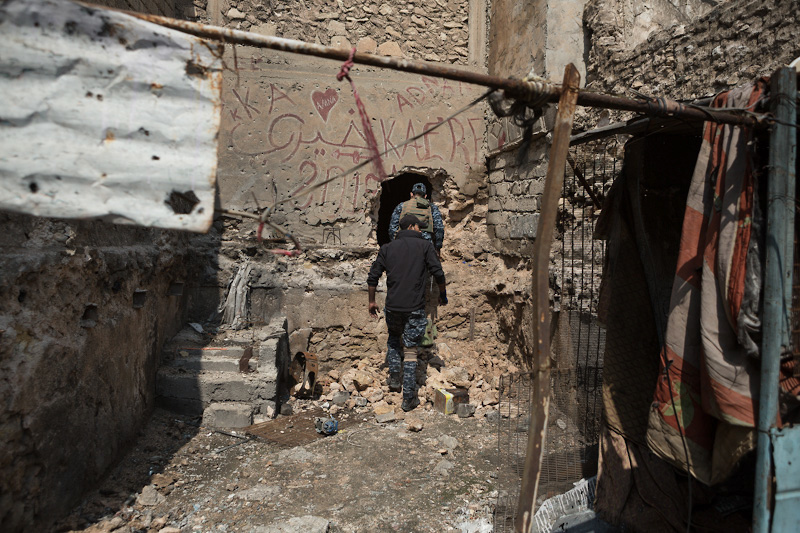 A rabbit warren of holes, smashed by ISIS militants before the battle, connects many of the buildings. 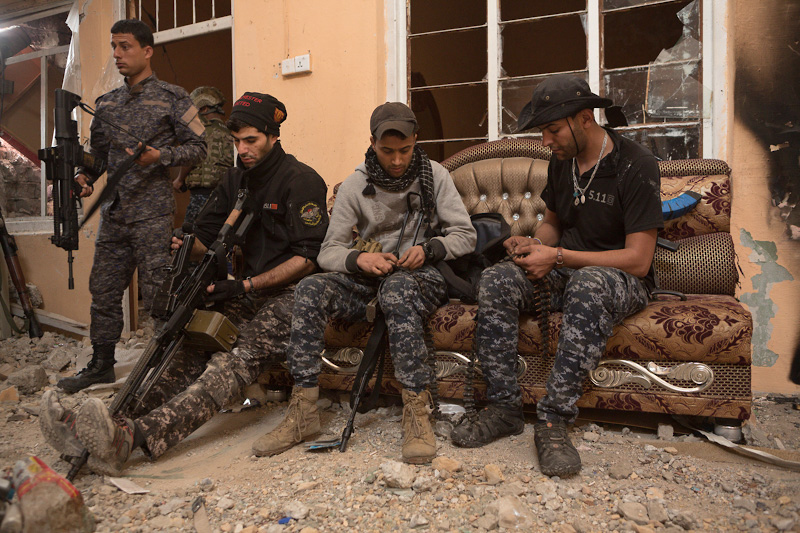 ISIS has also charged residents an extortionate “hole fee” for the cost of the labor, requiring them to either pay up or leave, according to Al-Monitor. Effectively, the holes function as an above-ground tunnel network. The Iraqis troops and ISIS are very close to each other in this part of the city. An officer, using a GPS application on his phone, says that the nearest ISIS position is 33 meters away. He corrects himself when the phone receives a better signal. “Actually it’s 19 meters!” he remarks. In some places the front line is only a thin door, often shot through with bullet holes and shored up with metal and household appliances. 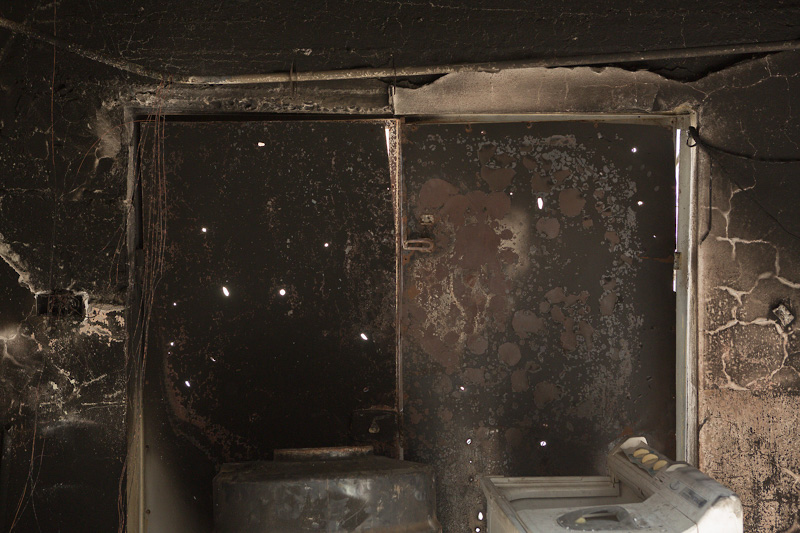 He points to a soot-blackened room that ISIS militants used as a fighting position. Empty bullet cartridges litter the rooftop and lie among chipped pieces of concrete and empty plastic water bottles. There are also a large amount of discarded grenade pins. The men on the roof say that, due to the proximity between the opposing forces, both sides often throw grenades at each other between the rooftops. Since no one is throwing grenades right now, the job of the men on the rooftop is to keep watch and shoot any militants they see. Mohammed calls another policeman to the roof, who brings a PK machine gun with him. As they talk, the second officer shoulders the gun, resting his weapon’s muzzle on the decorative bricks which surround the top of the rooftop wall. The round landed on a known ISIS position. The sharp, muffled echo of rifle fire is audible from downstairs as other men in the building shoot from inside rooms. Rounds fired back by militants crack low over the rooftop. An ISIS mortar round lands around 150 meters away, hitting a building behind the front line, but no one on the rooftop seems to care. A brief, 30-second lull settles over the battlefield. No one, on either side, fires. The only noise comes from two far-off patrolling attack helicopters and a coalition jet high in the sky. 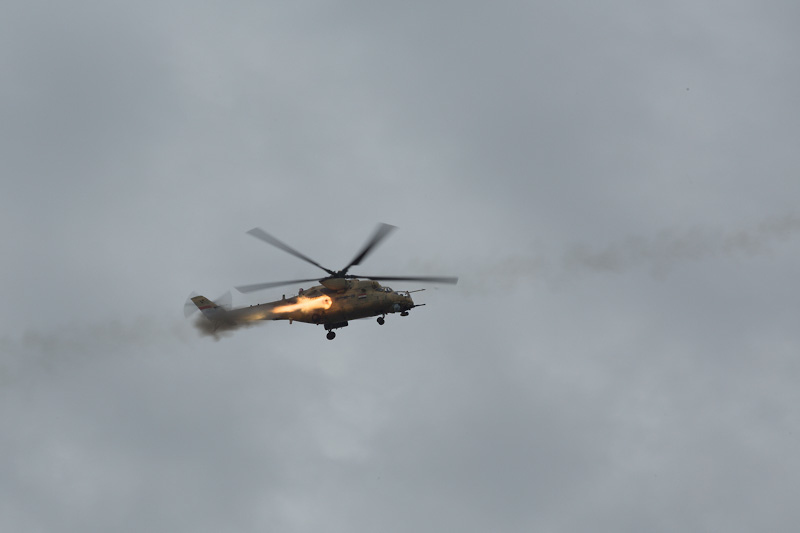 The lull ends when someone lets loose with hundreds of rounds from a heavy machine gun and the fast-firing cannon of an Mi-35 Hind begins to burp. 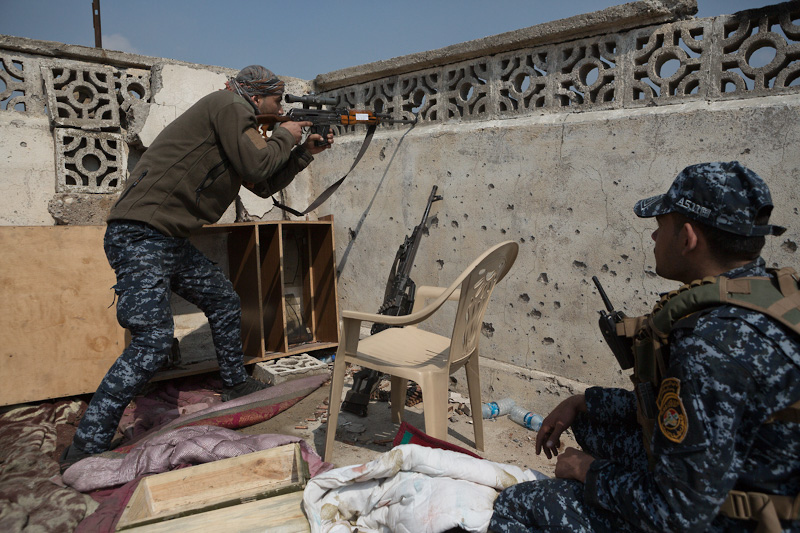 On cue, the rest of the Iraqi troops and the opposing ISIS militants resume firing. Two policemen sit on the roof in the mid-afternoon sun. Flies buzz between plates of discarded lunch—the food, in open polystyrene containers, slowly drying out in the heat. 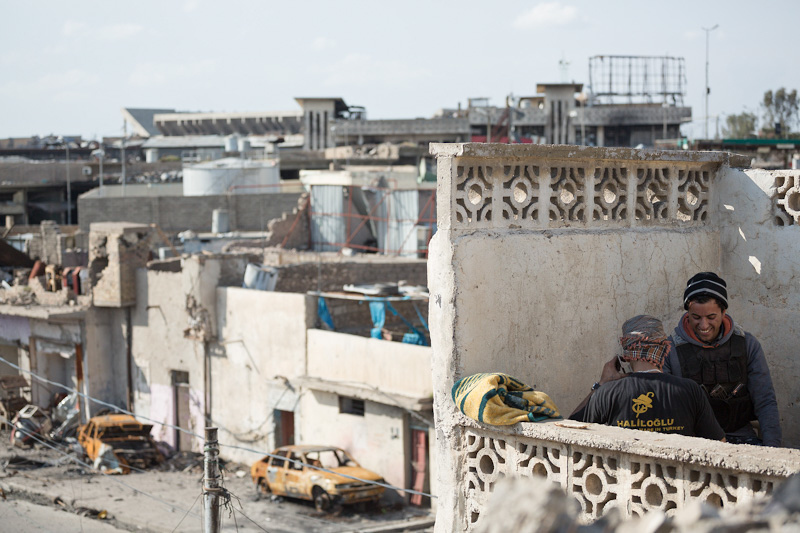 Twenty-eight-year-old Mohammed, born in the eastern Iraqi city of Al Kut, intends to get married after the war is over, although he says he’s currently single. “ISIS are evil to people,” Mohammed says, adding that he feels terrible when he watches local civilians attempting to flee ISIS territory for safety. Ten minutes later, more Federal Police officers make their way to the roof. Three men start to reload expended ammunition belts for the machine gun, and one officer uses a piece of wood to push the bullets into their final position, ensuring they are correctly seated. Even more officers pile onto the roof. In all there are eight policemen crouching behind the wall. 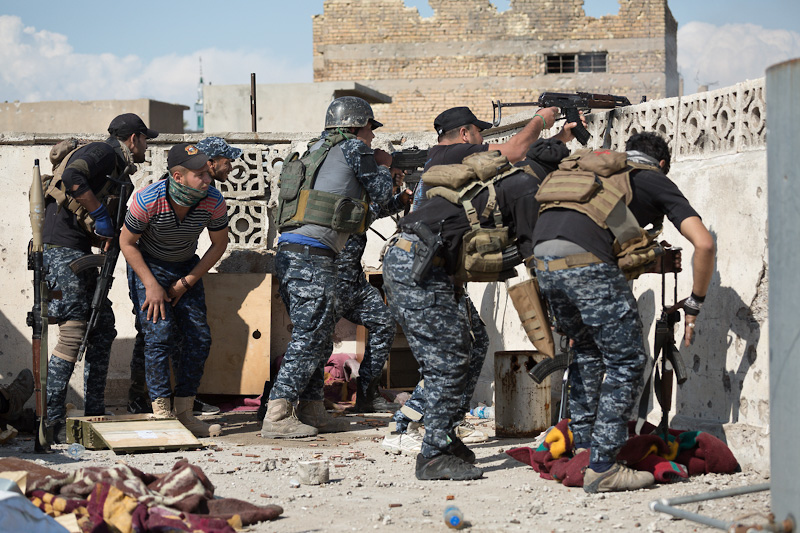 The extra manpower is necessary because a separate team of police officers are preparing to cross the street into the block where the Islamic State has been shooting at us. The team on the roof will provide suppressing fire to help their colleagues cross safely. The men move into firing positions on the roof, leaning two RPG launchers against a wall, just in case. One man stares through the scope of a PSL rifle, his eyes narrowed as he scrutinizes known enemy positions for any sign of movement. The officers discuss targets among themselves. Somewhere below, a man shouts. The PK gunner starts firing with long bursts, and the marksman with the PSL squeezes off an aimed shot. The rest of the men rise, taking it in turns to shoot. They fire fast single shots, some poking their weapons over the top without showing themselves, keeping as much of their body in cover as possible. The firing continues for two minutes, ending once their colleagues finish crossing the road. Muffled voices shout from the buildings across the street—the police have made it. Men in the team crack jokes as they move back into cover. Without realizing it, two ISIS fighters picked the worst moment to cross another part of the street around 100 meters away. The machine gunner and sniper shot both. 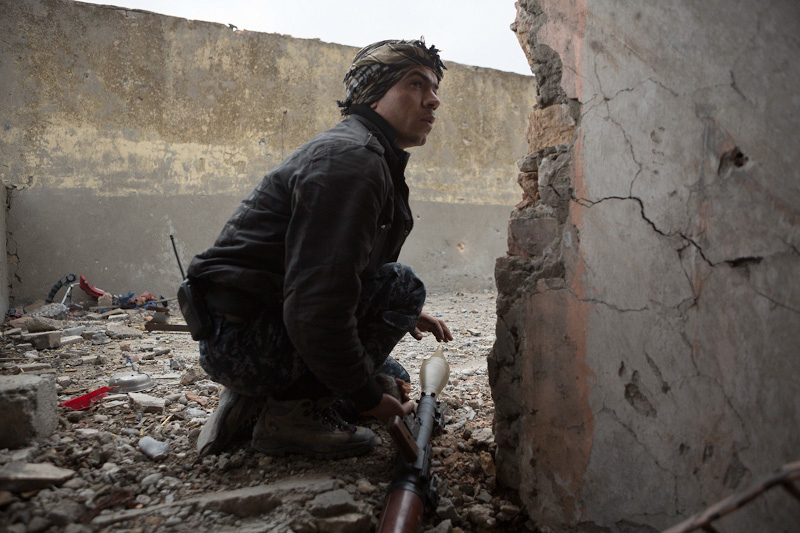 The ISIS fighters soon retaliate, flinging a mortar shell which explodes on top of a building 50 meters away, sending masonry tumbling down onto the street below. The dust from the denotation lingers in the still afternoon air. 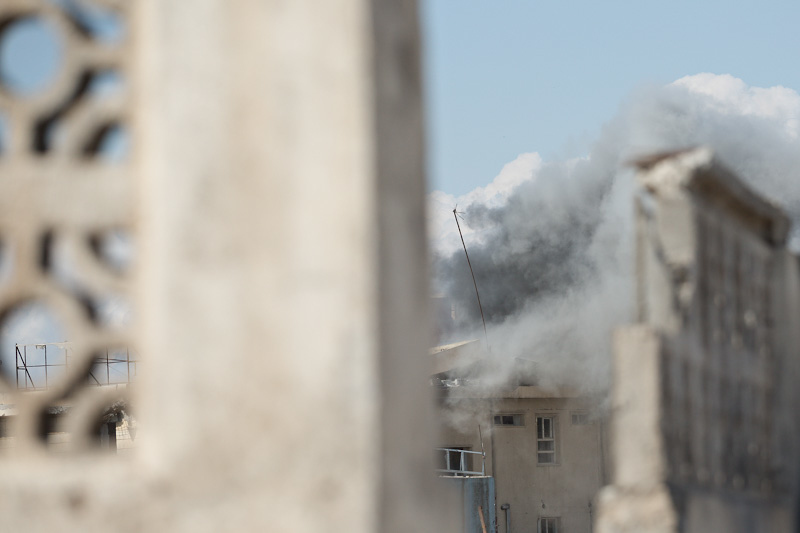 The militants lay down withering fire, targeting the police on the roof. Rounds slap against the concrete wall, but most pass close by overhead. The fire is ineffective. Mohammed and a friend descend from the roof, laughing and joking as they talk on a cellphone. Two officers remain on the roof as the rest of the team heads inside, where they sit and talk, passing time as they wait for the incoming fire to die down. Back on the rooftop, the two men work together scanning rooftops and windows for any sign of movement, giving the other police officers some much needed rest—a necessary respite in what is the heaviest urban battle, currently, in the world. 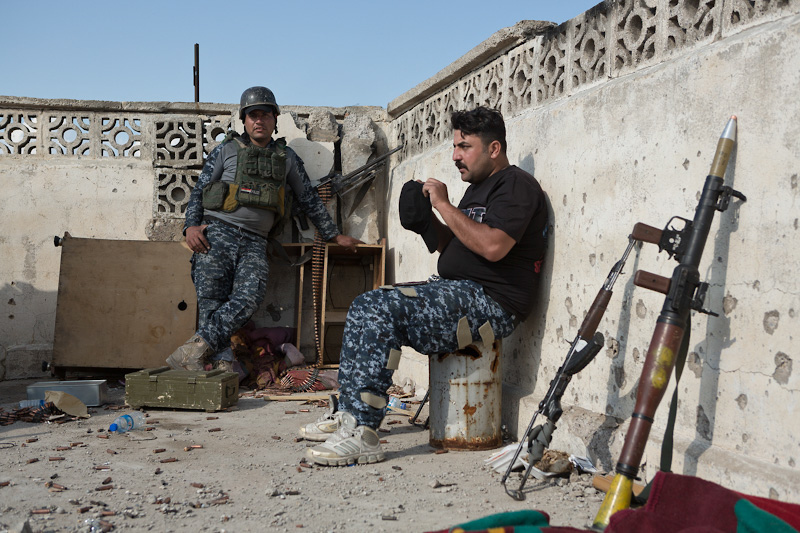 Iraqi Federal Police officers rest during a break from fighting in West Mosul’s Old City.